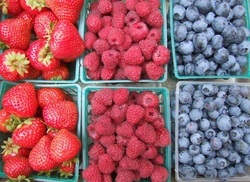 PYO- Strawberries, Raspberries, Blueberries and Flowers! Our "Pick YOUR OWN" Strawberry Patch is open from mid-June to July. Blueberries start in July. They usually overlap. This year we will have pick your own at the farm stand at Route 50. ​ Call the stand at 518-399-5931 to be sure the patch is open. Starting in July, the fields next to the stand are in full blossoming beauty.​ We start the seeds in March in the greenhouse at our sister farm in Coxsackie. Mid May you will see the crew out planting the flowers in the fields next to the stand. By July we start picking and putting together the most beautiful bouquets that are sold at the farm markets and our roadside stands. 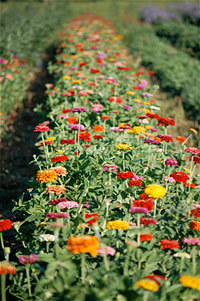 Once the flowers are in full swing we open up "Cut Your Own" for our customers and CSA memebers. Many Brides have used our flowers for their wedding. Contact us at 518-399-5931 to schedule a meeting . Open 9-6 daily . !